Growing Gerbera DaisiesGerbera daisies are delightful plants to grow both indoors or outside, in pots or in borders. They are generous bloomers, lighting up the air around them with spashes of vibrant color in vivid hues of white, yellow, mauve, pink, orange and red. There are about 29 species of Gerbera daisies (also called Barbeton Daisies or Transvaal Daisies) most of them native to Africa. Commercial varieties are derived from the original cross breeding of G. Jamesonii and G. viridifolia. A good choice for an indoor windowsill is G. Happipot, a compact variety with flower stalks of 10 to 12 inches high (about 30cm). For uniform results from homegrown seeds, choose G. Parade. Gerbera daisies can be grown from seed, although germination can be sporadic. Despite this, it is worth collecting seeds in the fall because you’ll be able to harvest many seeds from each plant with plenty of viable seeds among them. Plant the seeds in a seedling mix and keep uniformly moist; germination should occur in about two weeks. The plants need warm temperatures to thrive, so in a cold climate start the seeds indoors and plant outside only when the temperature is consistently in the 70F° range. Harden off gradually, placing the plants outside for a few hours at a time, gradually increasing the sun exposure. In warmer climates, where Gerberas are grown as perennials, you can plant the seeds directly outdoors where you want the plants to grow. Well-established plants can be propagated by crown division. Large Gerberas produce suckers, which you can be split off from the mother plant, being careful to keep some roots with each new division. Plant the suckers in pots, or in the ground, with the crown about one inch above soil level, then water well. It is also a good idea to cover the new little plants with a cloche or plastic bag to maintain humidity until new roots are formed. In colder climates, Gerbera daisies are treated as annuals, much like zonal geraniums, with new plants or seeds being grown every spring. 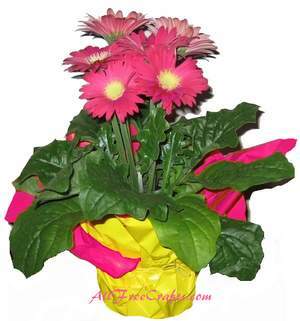 Potted Gerbera Daisies kept indoors like a bright windowsill and at least six hours of indirect sunlight for blooming. Typical office lights aren’t enough to keep Gerberas happy. Allow potted plants to dry out a little before watering to avoid root rot. Outside, the plants appreciate a warm, sunny spot, with well-drained, sandy soil. In tropical climates, the Gerbera may suffer in intense afternoon sun so partial shade is best in those conditions. Feed flowering Gerberas with water-soluble fertilizer high in potassium and and phosphorus. Remove wilting blooms by twisting or clipping off the stem at the base; regular deadheading will promote more flower production. Red spider mites can quickly infest Gerbera, creating a puckered look to young leaves. Misting the plants will increase humidity and help discourage red spider mites. However, if an infestation does set in, it’s best to discard the entire plant and start again with fresh soil and seeds or another purchased plant. Check the undersides of leaves on new plants to make sure the plant is pest-free. Aphids also like Gerbera daisies, but these can usually be controlled with pyrethrum insecticides or soaps. Fungal crown and root rots can beset Gerberas, particularly if the crown is planted too deeply or if the plant is water-logged. Gerbera daisies are a favorite of florists for bouquets, wedding flowers and other floral arrangements. For inspiration on arranging your own bouquets of Gerbera Daisies, check out the video, How to Make a Daisy Bouquet or view this brief video tutorial from Afloral, which shows how to make a simple Hand-Tied Gerbera Daisy Bouquet.